When people think of Amsterdam, one of the first things that spring to mind are bicycles and certainly last on the list is usually cars. It is true that traffic in the city centre does also include cars but they are massively outnumbered by the two-wheeled form of transport. Indeed by far the majority of all journeys in the city are made by bicycle rather than car. The reasons for this are largely simply because of space. The city centre was designed in the 17th century and the modern day realities of mass tourism and commuting were not an issue. Today, the car is simply not considered a priority for life within the city. Whilst hiring a car may initially seem like a great idea for visiting and traveling around the city, the reality might create more stress for your holiday than you ever imagined. Firstly one should consider safety for yourself and others around you. Regular Amsterdam drivers have become used to looking out for thousands of bicycles weaving across the streets, behind them, in front and appearing suddenly at either side. The biggest deterrent for bringing a car into the city is the extremely restrictive parking options and excessively high parking fees and of course fines. We at Amsterdamapartments.com wish to provide you with facts about driving and parking in the city of Amsterdam so you can make up your own mind about whether to arrive on four wheels or not. 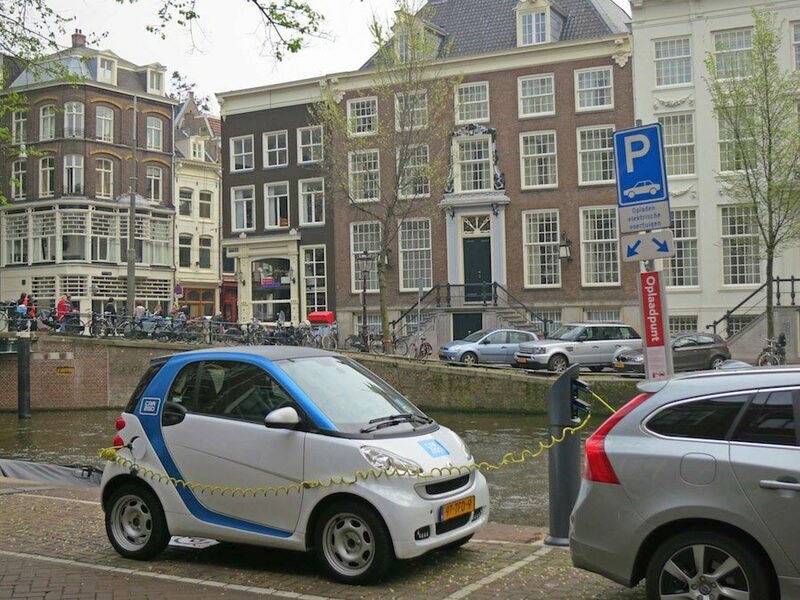 The local council for Amsterdam actively discourages the use of cars in the city. A great number of streets within the city are closed for car access making it a real headache to find your way around unless you are familiar with the available routes. Basically the entire area within the A10 ring road that circles the city demands steep parking fees. The most expensive parking fees are within the very centre of the city on the streets themselves. Strict compliance to all displayed parking rules is demanded by the local council traffic department. If you are insistent in bringing a car into the city you can park it for around €5.00 per hour. You may prefer to purchase a day ticket (though it only lasts from 9:00 until 19:00) for around €26.00. For evening parking between 19:00 and midnight a night ticket is required. The cost varies depending on neighbourhood location from around €4.00 up to €17.00. Tickets covering day and night parking are available for around €39.00 and again vary depending on neighbourhood and centrality. Weekly tickets are also available at a cost of around €158.00. Payment for all tickets can be made at the parking meter itself which will print out a valid ticket. To find valid parking spots in the city centre look out for the blue light boxes emblazoned with the white letter P. There are in total around 80,000 parking spaces available. Check the Cition website which provides a helpful map with hourly parking rates by neighbourhood here. On-Street Parking fines, clamping and vehicle removal. Cars are regularly observed by traffic wardens to see if they are outstaying their paid time or are parked wrongly. Fines are hefty so be warned. It is possible for your car to be clamped. Illegally or dangerously parked cars can and will be towed away quickly. It is essential that you have a valid parking ticket displayed behind your windscreen. If you receive a fine upon your vehicle then you may need to visit a vehicle service point to make a payment. There are a number of service stations located throughout the city working under the name Cition. One of the most central service points in the city is at De Clercqstraat 42-44. You can call 14 020 from a Dutch landline phone to speak to the main help centre for information. Their official website is cition.nl. If your car is towed away you can collect it from the depot at Daniël Goedkoopstraat 9. This car lot is open daily from 07:00 until 23:00. You should expect to pay at least 150 euros to have your car released to you. Official Car Parks in the City. For many people just one experiencing of driving within Amsterdam city centre is enough to make them opt for the relative comfort of sitting on a tram, bus or metro. Peddling along on a bike is considerably less stressful and dangerous and even relaxing. Therefore many visitors travelling into the city from outside choose to make use of the many park & ride facilities located on the outskirts of the central Amsterdam area. Excellent public transport connections are available here enabling you to reach your destination with ease. You will find the Park and Ride facilities located close to the A10 ring road. The concept is simple. You park your car for a basic fee of around € 8.00 per 24 hours. It is possible to leave your car for up to four days. You also receive a special public transport ticket known as an OV Chipcard which will allow you to ride the effective public transport systems into the city centre and then return to your car later. These special cards can cover up to 5 people per card but cannot be used for travelling around the city. For this purpose you will need to purchase regular public transport OV Chipcards as well. This can be bought form the Park & ride location too. Most Park & Ride locations are open 24 hours a day, 7 days a week. Although they are supervised parking facilities it is essential that you do not leave anything of value in your car as break-ins do happen. P+R Bos en Lommer, Leeuwendalersweg 23b, (This car park is only open for entry from 07:00 until 22.00 however you may with your car at any time). P+R Gaasperplas, Loosdrechtdreef 4 (This car park is only open for entry from 07:00 until 19:00 however you may with your car at any time). P+R Olympisch Stadion, Olympisch Stadion 44, Capacity: 250, (This parking lot can also provide free bicycles to lend to you – up to two bicycles per car. Your ID will be required). P+R Sloterdijk, Piarcoplein 1 (Sloterdijk train station), Capacity: 200, (This parking lot can also provide free bicycles to lend to you – up to two bicycles per car. Your ID will be required). P+R World Fashion Center, Koningin Wilhelminaplein 13 (by the World Fashion Centre – One of the closest car parks to the centre of Amsterdam).